Well, as George Washington once said: “it is better to offer no excuse than a bad one”. So let’s just get on with this beer review, shall we? 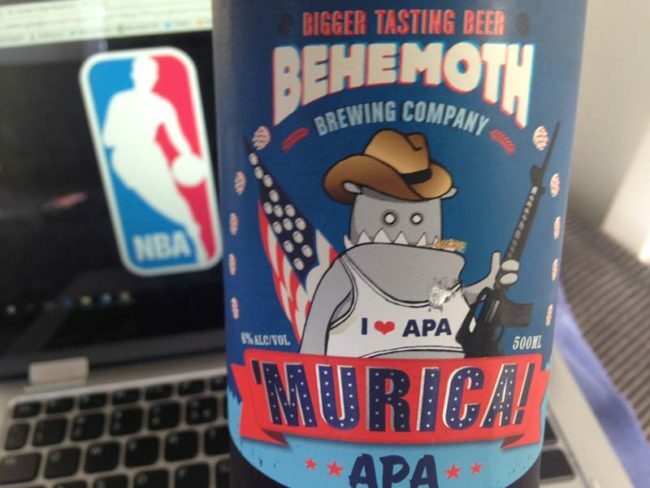 The bottle: Behemoth Brewing get top marks for the design of this bottle, which boasts the company’s emblematic monster holding what looks like an AK-47 in front of an American flag, while wearing a cowboy hat and an ‘I heart APA’ singlet. Blurb on the bottle: This beer represents freedom. Freedom to enjoy all them ‘Murican hops. Because, as well all know, if you don’t love hops the terrorists win. ‘Murica shows off huge aromas and flavours from some of our favourite hops. Stone fruit and pine burst out at ya; these taste of freedom and loose gun laws! Enjoy y’all. The brewery: Behemoth Brewing Company was born out of a hobby, which quickly tuned into an obsession, then into a life dedicated to good beer. Life is too short to take too seriously, so the only thing we take seriously is bigger tasting beer. Beer consumes us and, in turn, we consume it right back. Tastes like: USA! USA! USA! As Steph Curry and the Golden State Warriors win out game four of the NBA finals, the American hops in this flavoursome beer win over my taste buds. It’s herbaceous, slightly resinous, and more bitter (bitterer?) than the typical New Zealand crafty IPA. It smells less like tropical fruits, too, and more like plants, grass, and lemon. It pours a sparkling butterscotch colour, with a thin white head that sticks to the glass like Draymond Green to his opposition when in defence. The verdict: I love the bold loud-mouthed American hops in this beer, which are reminiscent of LeBron James at his very best, which he’ll have to be if the Cleveland Cavaliers are to turn around this 3-1 deficit in the NBA finals series against the Warriors.